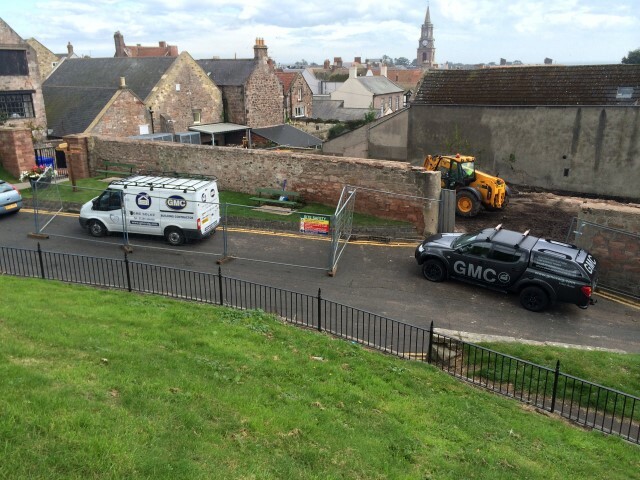 Day starts with securing the site with temporary fencing and securing the site for public safety. 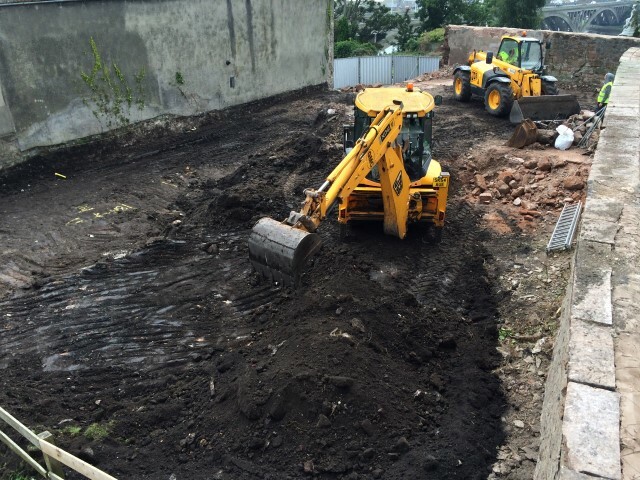 With the site secured excavations begin, several hundred tons of soil require removal before services & foundations can be set out and fitted. 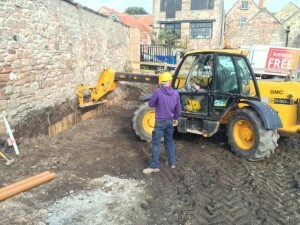 Great start to the month with excellent weather conditions on site for ground works! With the site cleared foundation excavations have begun, GMC use lazer level systems to keep our sub-structure as accurate as possible. 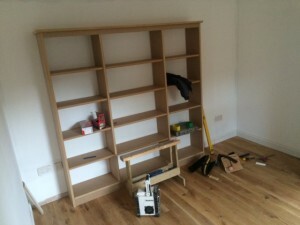 This makes the rest of the build much easier and more accurate. 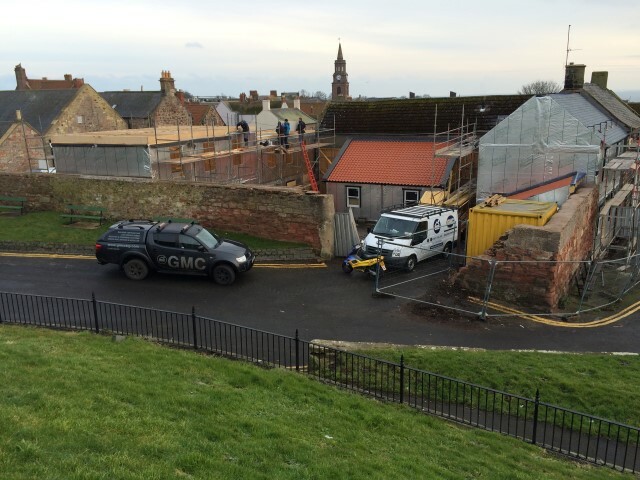 Not your average builders at GMC! 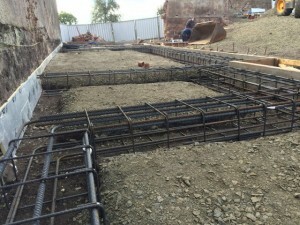 forming steel cages Engineered for poor soil conditions and stabilize existing structures around the new development. 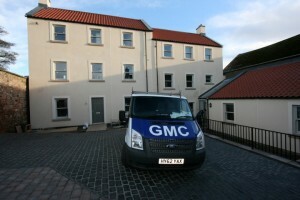 GMC complete all this work in-house, with the same squad who will carry this project through to the finish. 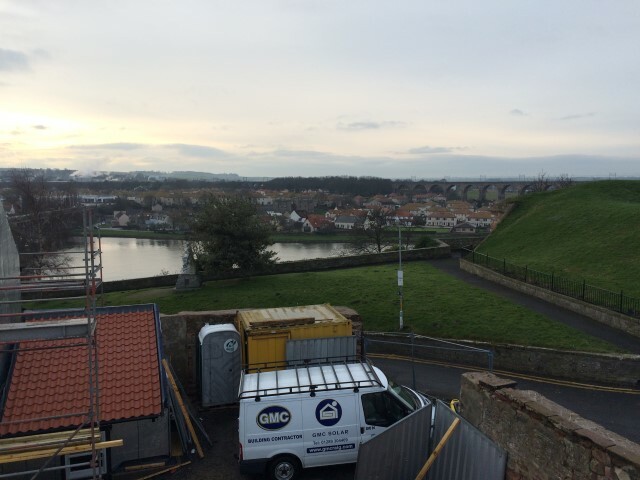 George Craig on site, with over 30 years experience in the construction industry George is GMC's number 1 asset. 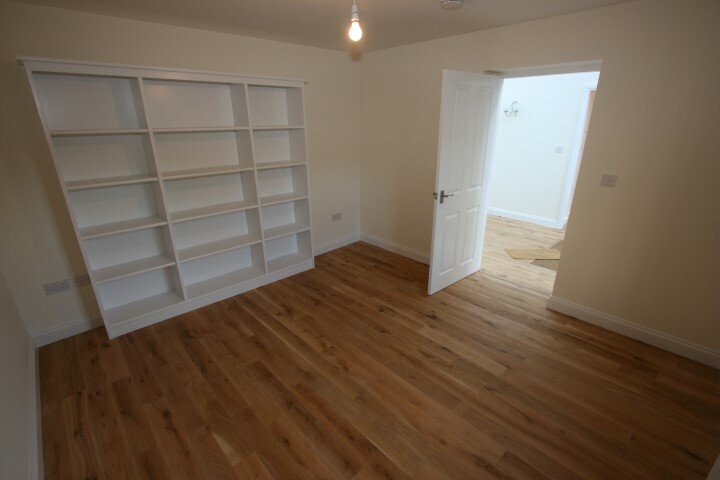 A considerable bank of knowledge in all types of construction. 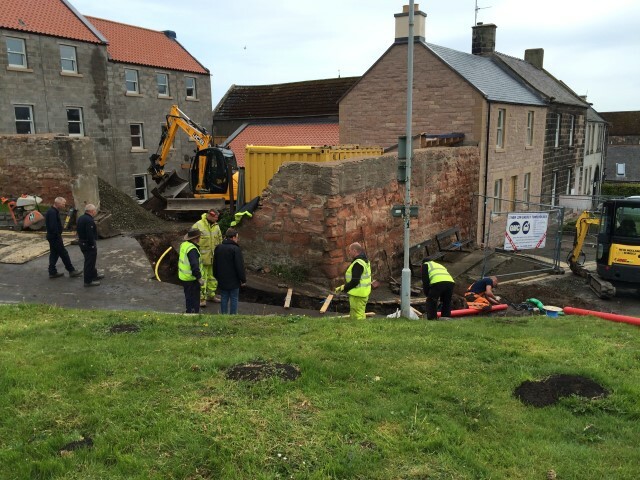 Here he is consulting with Alistair one of our head trades engineers on steel work and services. 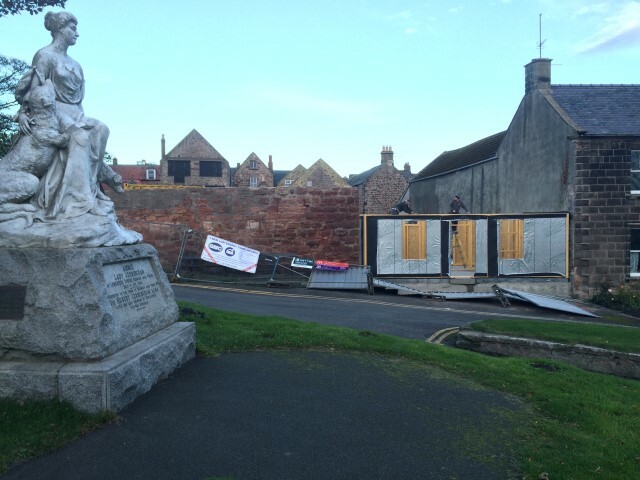 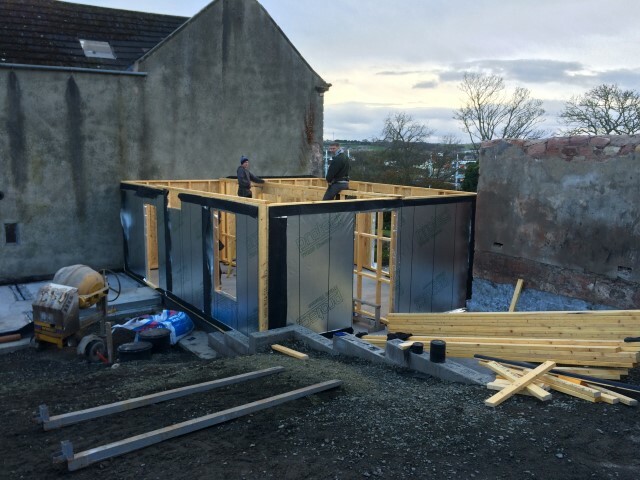 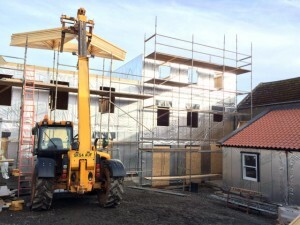 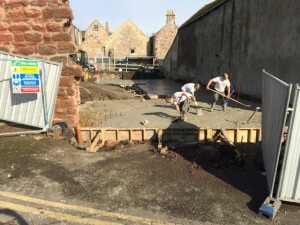 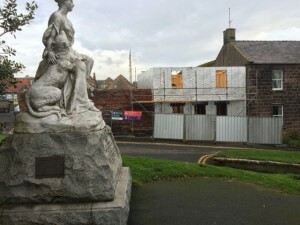 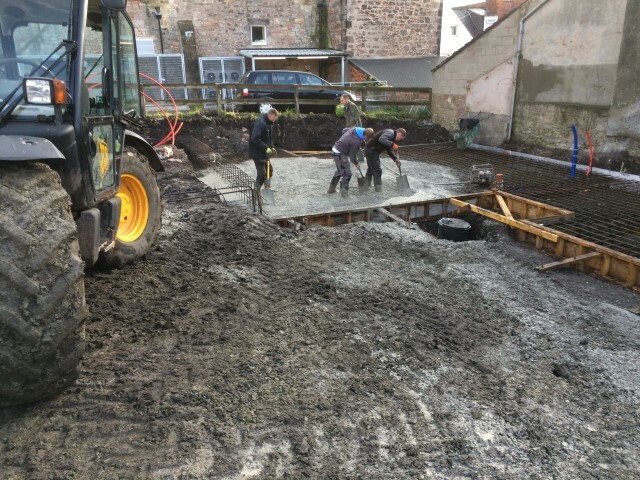 After weeks of preparing the sub-structure metal work to reinforce the structural slab which supports the properties, it was finally time to cover all that hard work C35 Concrete delivered by Gilbert Birdsall of Belford. The GMC team poured 60m³ of concrete in one day completing 2 of the 3 properties foundations. 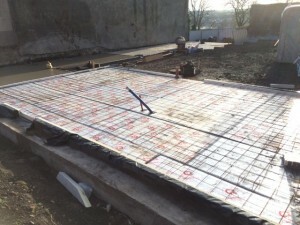 This volume of concrete is a highly skilled and organised event with specific methods and logistical planning to ensure the concrete sets to the correct specification. All drainage and service ducts are already in place and arrive within the property at the desired position, usually a utility cupboard or under stair location. 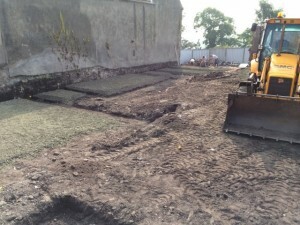 These positions are carefully measured out so land in the exact position required. 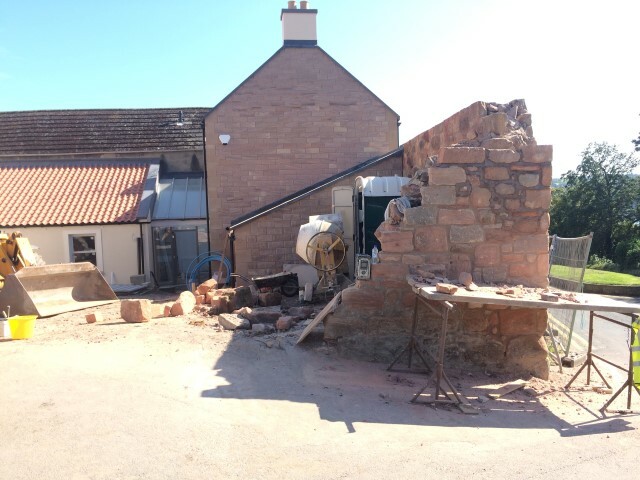 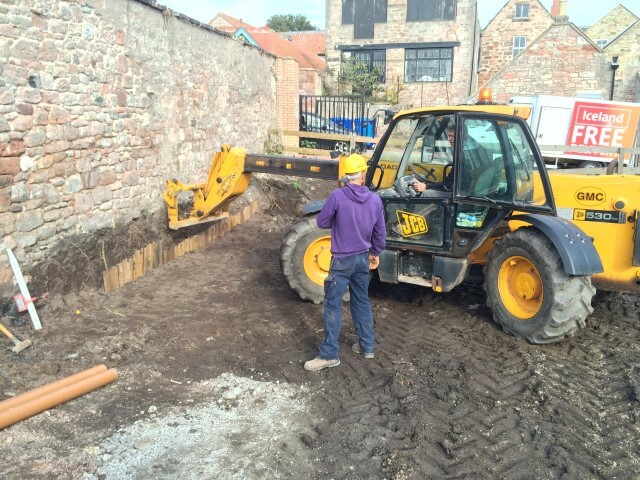 As part of the development an existing stone wall requires support at ground level to allow foundations to be fitted in close proximity. GMC ground works team managed to secure the wall using shoring techniques rather than de-stabilizing using under pinning techniques. 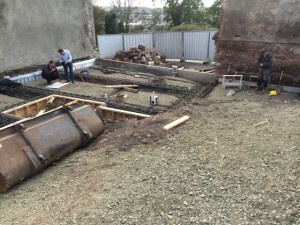 With all the structural floor slabs in place. 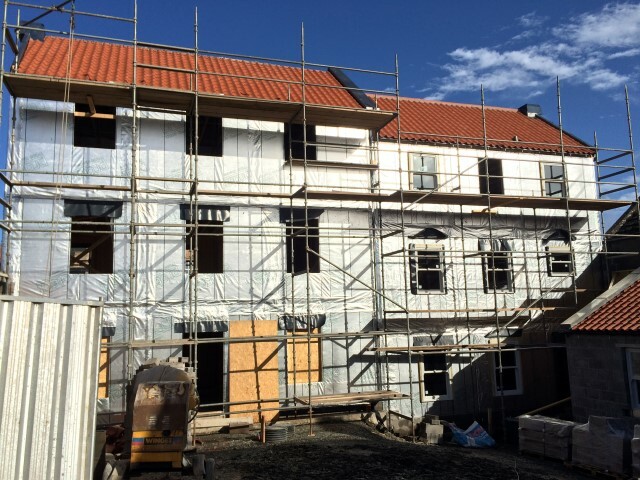 GMC now insulate over the top of the structure with PIR insulation board, cover with A142 anti crack mesh and more concrete over the top. 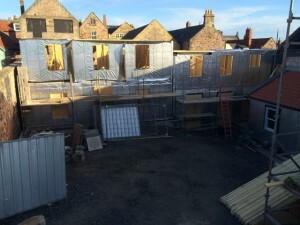 Photo shows 2 of the 3 town house ground floor structures complete with the 3rd floor prepared ready to go. 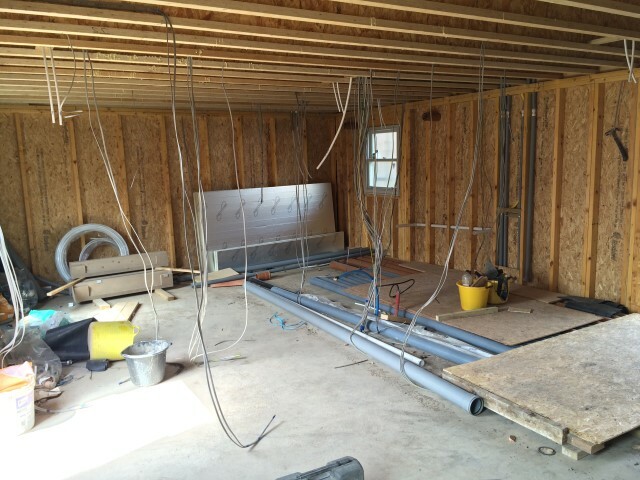 Once the final floor is poured, the Team begin Timber frame manufacture in the GMC workshop. 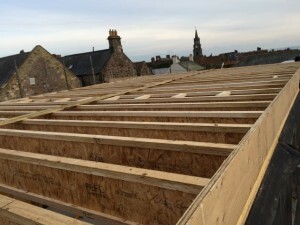 The team are on a mission to get the first kit manufactured and erected with roof covered before winter sets in. November started with Excellent weather on site. 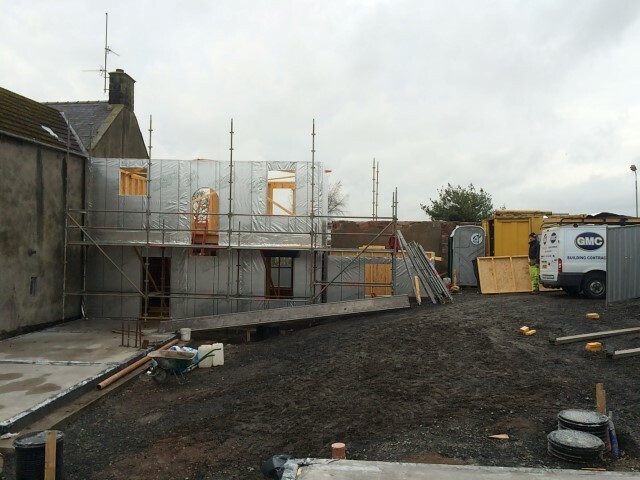 With the Timber frame manufactured during the recent spate of bad weather halting progress on-site. 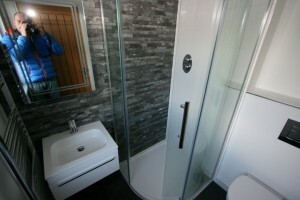 The Team were good to good ASAP. 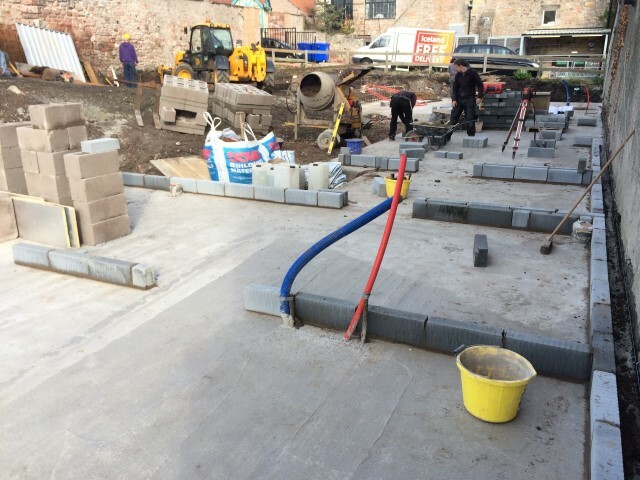 With excellent conditions and a well executed the team had the ground floor kit up in a morning ready for the Timber engineered floor arriving Tuesday morning. Excellent views all the way down to Holy Island and Beyond. This photo show shows the timber frame from inside the private court yard which the 3 properties share. 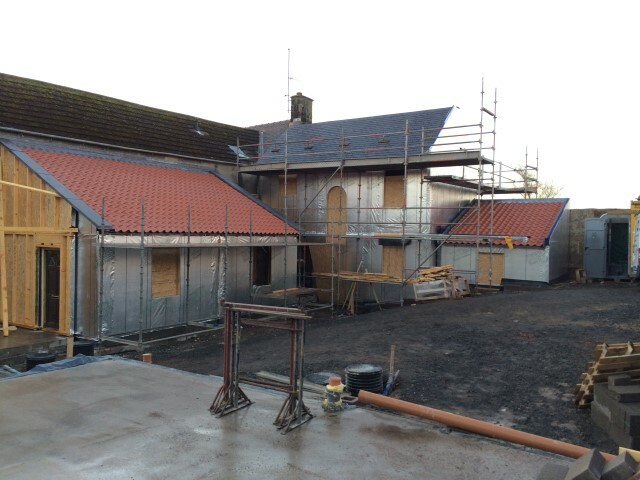 December has started with good progress with the construction team pushing on to get the first property wind & water tight. 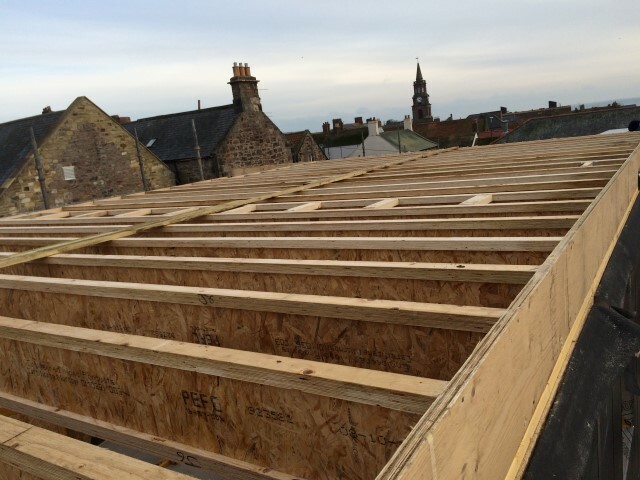 Ground & First floor timber kits erected ready for roof trusses. 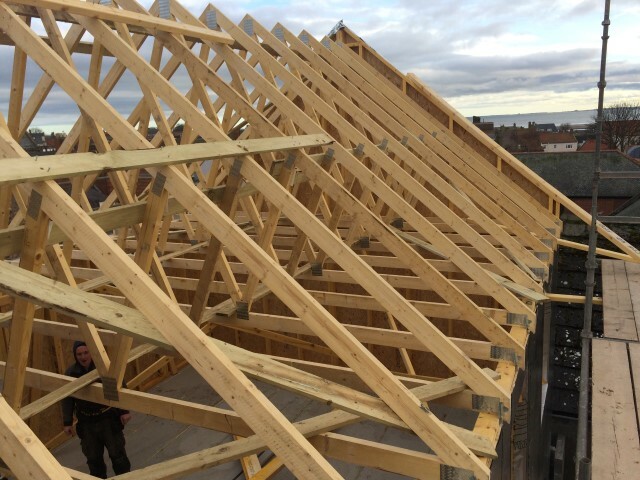 Trusses in place and with roof board & breathable felt fitted. 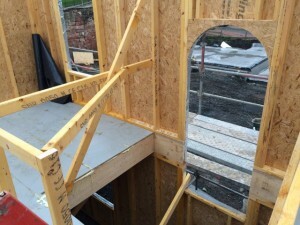 The inside of rose mount starting form with single storey structures formed with the private court. Roof scapes are made more interesting with the use different materials. All traditional Natural Slate, Pan tile & Lead look and give a feeling of high quality for the developments prestigious location. 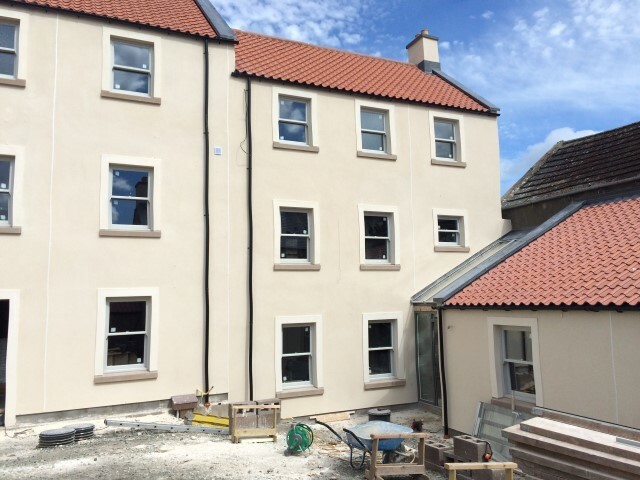 New high performance windows, double glazed and sealed sash & case Timber windows keep the high quality theme for these homes. After 2 weeks break for Christmas & new year the Construction team are refreshed and back in full swing with plots 2 & 3 timber frames under erection. 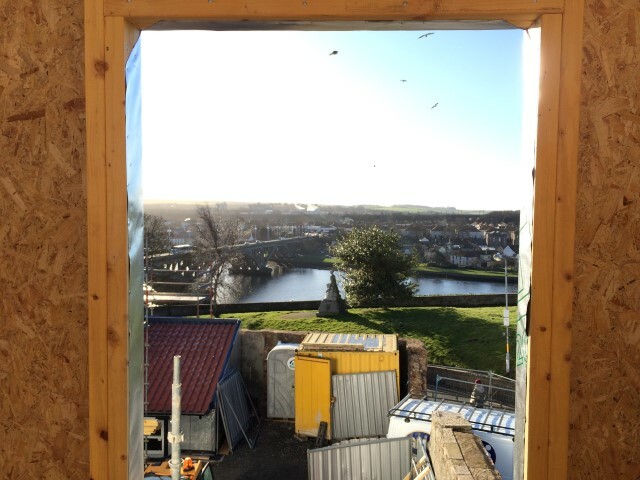 The team plan ahead with the weather and are on-site for decent weather (although very cold! 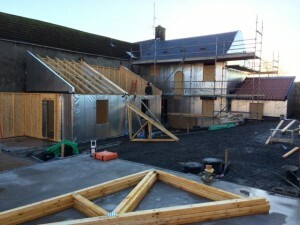 -1 today) and retreat back the workshop to make panels during harsher conditions which slow progress on external work. 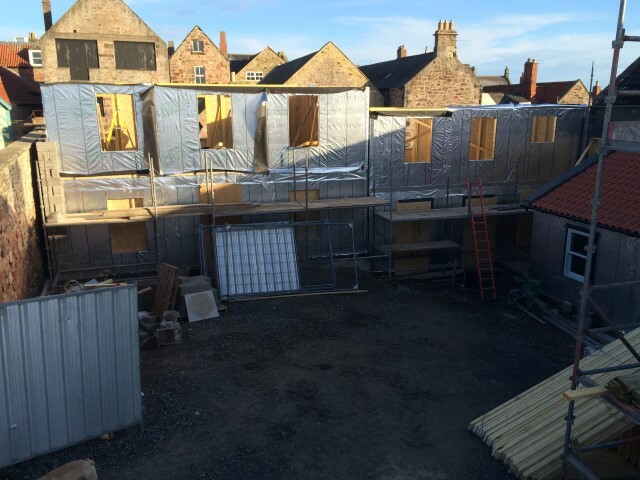 The development is progressing and well and really starting to take shape! 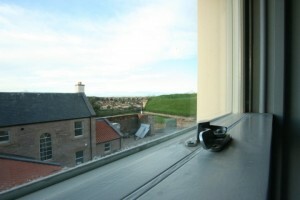 Uninterrupted views to the south west photo taken from finished floor level this is the actual view, from a town center property! 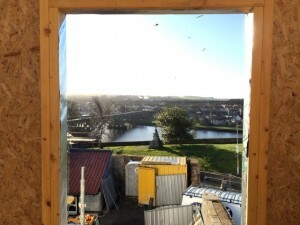 More amazing building weather for the end of January to the start of February! 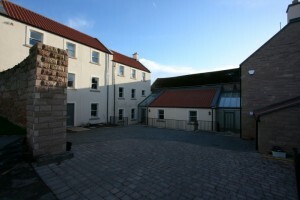 With the 3rd property at the development under offer, completes the sales at the development! 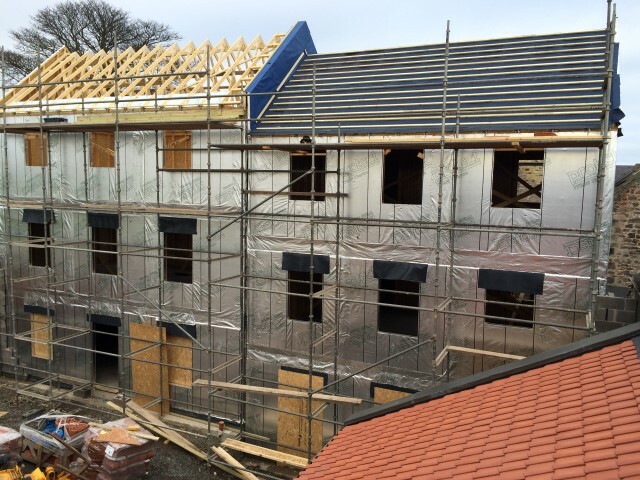 2nd floor timber frames manufactured and fitted on site. GMC in-house plant lift the materials up to working area. Manufactured roof trusses, in place with bracing supports for the structure being fitted. 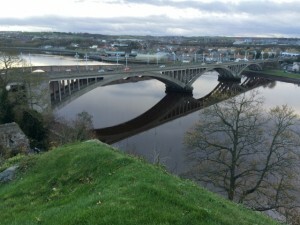 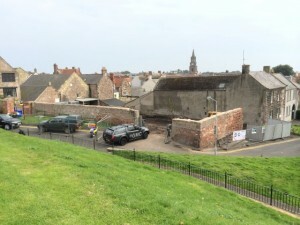 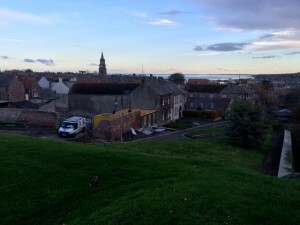 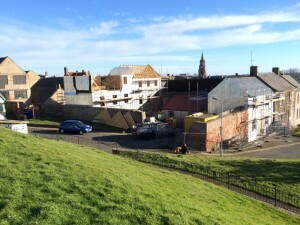 View from Megs Mount looking at the whole development with Berwick upon Tweed's Town hall in the distance. 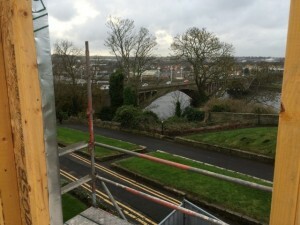 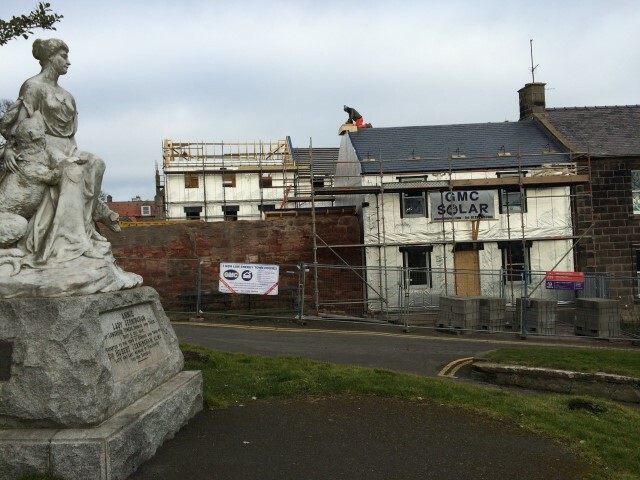 View from the front of the development, GMC have changed the view of the town from crossing the New Bridge! Properties 2 & 3 viewed from inside the court. View over the river from the rear properties! 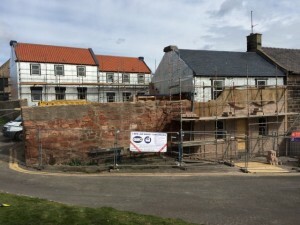 March is now complete with excellent progress on site! 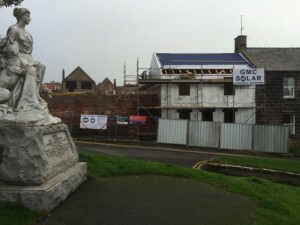 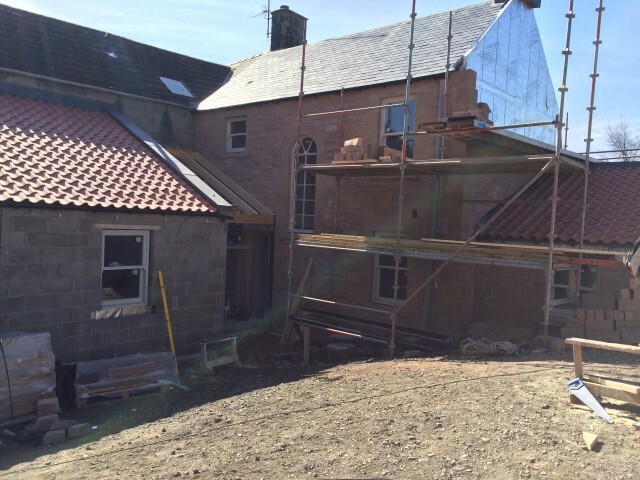 we now have all 3 properties fully wind and water tight. 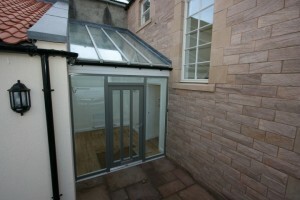 Both roof areas finished with pan tiles for a conservation appearance. 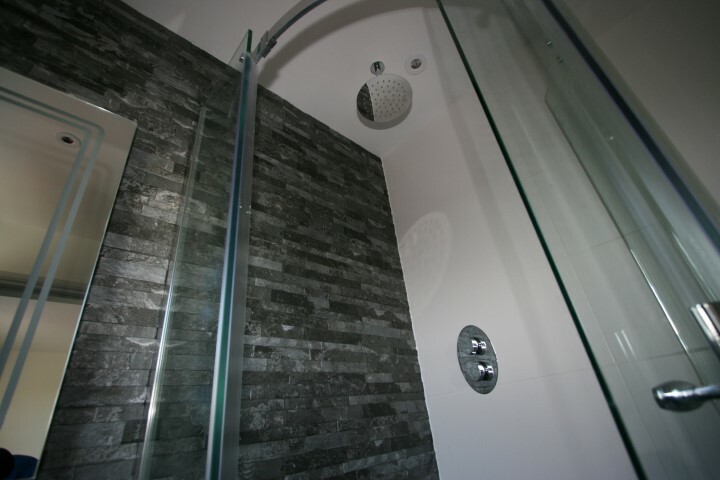 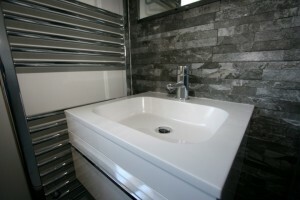 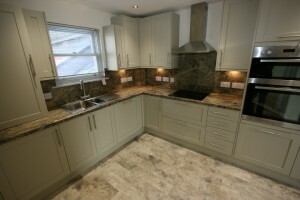 Natural stone supplied by local stone merchant Hutton Stone. 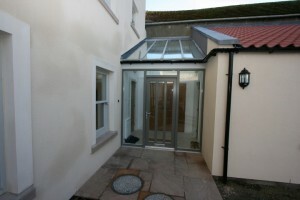 Finished with matching Pre-Cast quions and details supplied by Border Concrete. 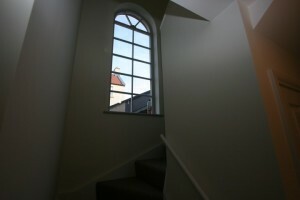 Feature window on the staircase to the front property finished stone work. 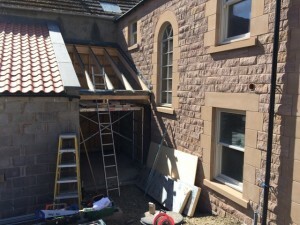 Rafters in place for glazed roof area. 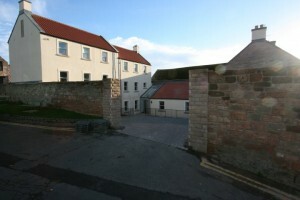 The development for the front blending in nicely with existing buildings and area. 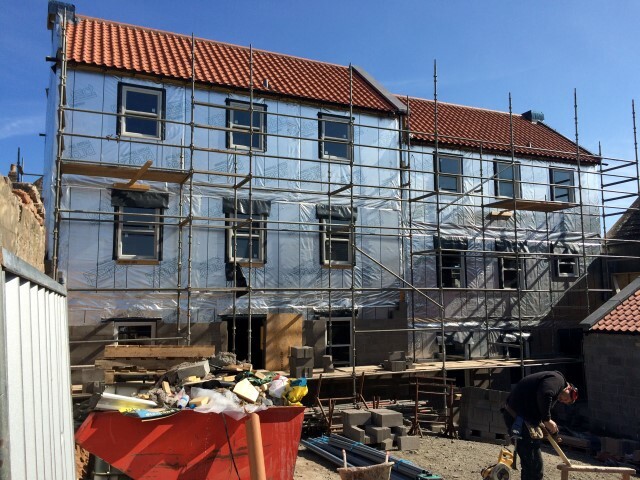 Amazing weather on site for most of April! this allowed the on-site team to complete the natural stone work to the front house, it looks great with the scaffold down! Another beautiful month with only a few wet days on site. 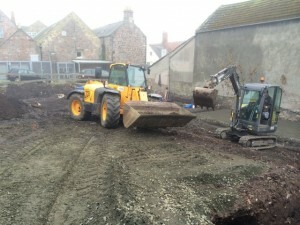 A big month on site, we now have services to site! 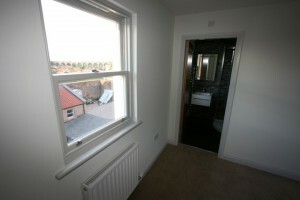 including electric, Gas, water & telecoms. This involved bringing the services up the road to the site. 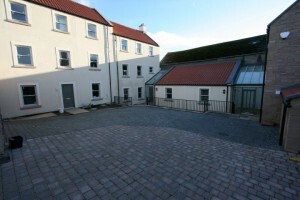 Approx 100m in the road past the neigbouring care home. 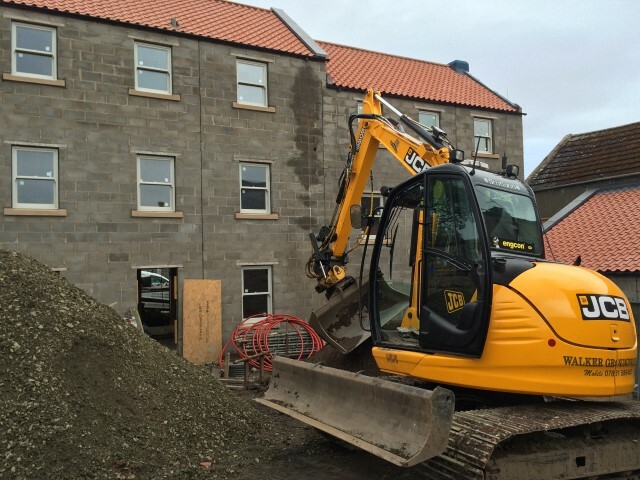 This required careful planning with 4 different utility companies, Northumberland county council & our nominated registered ground works contractor. 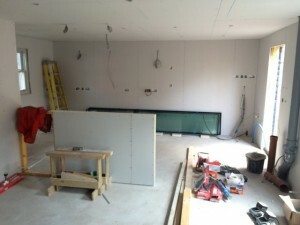 Head boss at GMC George planned and executed the whole operation without a problem. 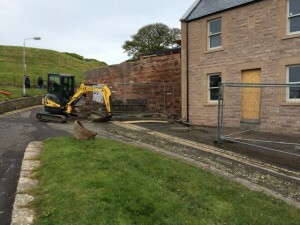 He planned the works in a way that kept the road open while the works were carried out. 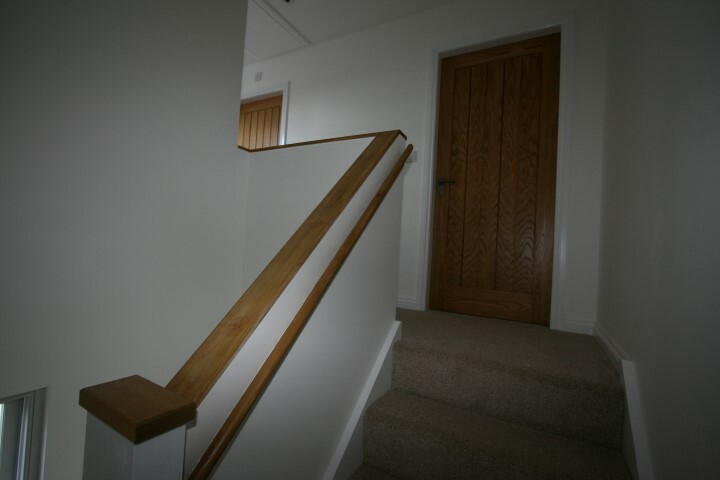 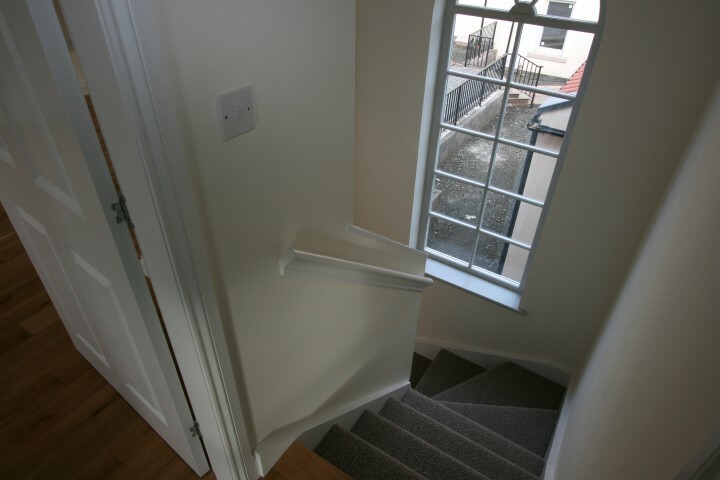 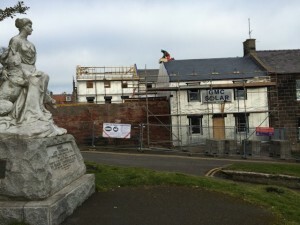 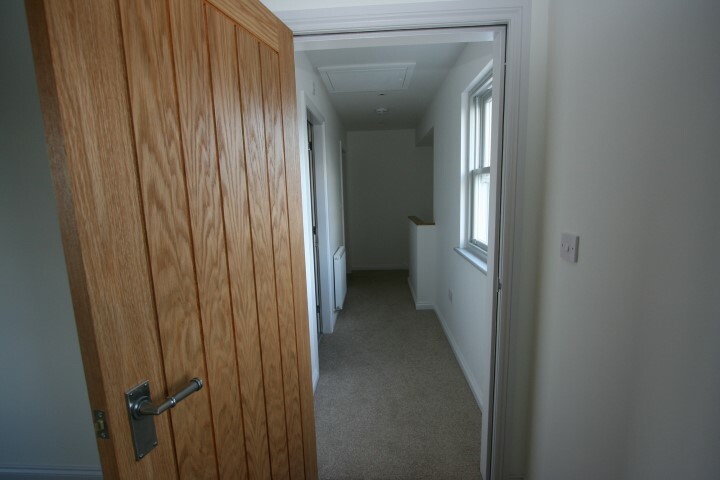 With the care home in close proximity to the works, the main objective was to allow normal traffic flow and access for emergency services if required. 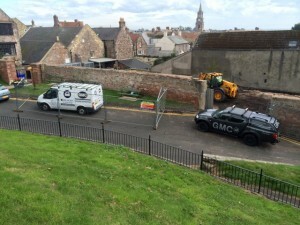 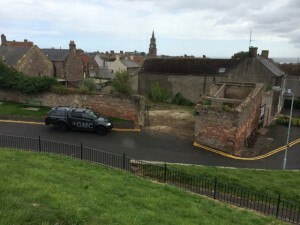 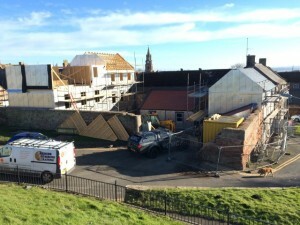 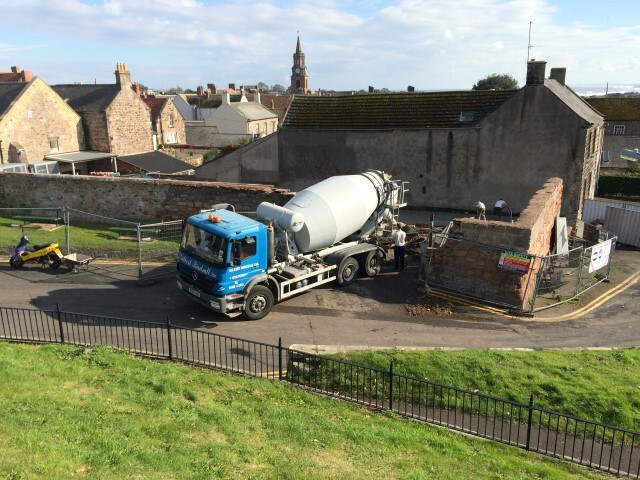 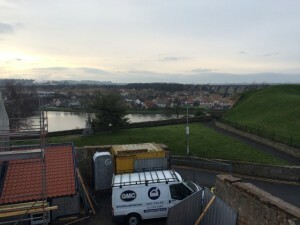 Ground works team, during services work at Rose mount, Bank Hill Berwick upon Tweed. The block work to the rear properties is now complete ready for render finish. 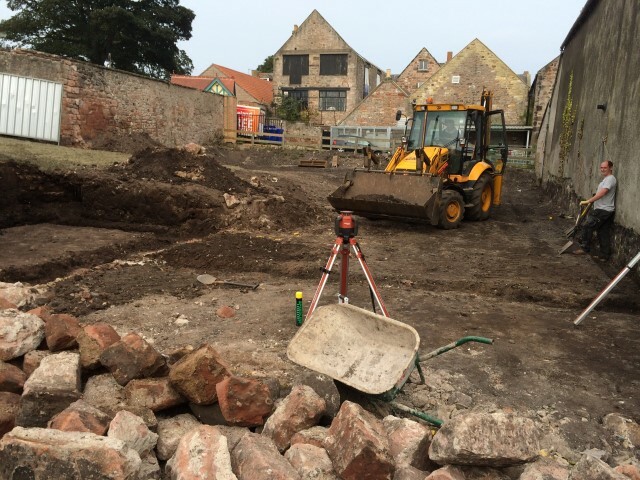 With this work complete the ground works team are back in to the main court yard to start shaping up works. Mixed weather on site during June at bank hill. During the wet spells the site team have moved inside to rough out the internals along side plumbing & electrical first fix. 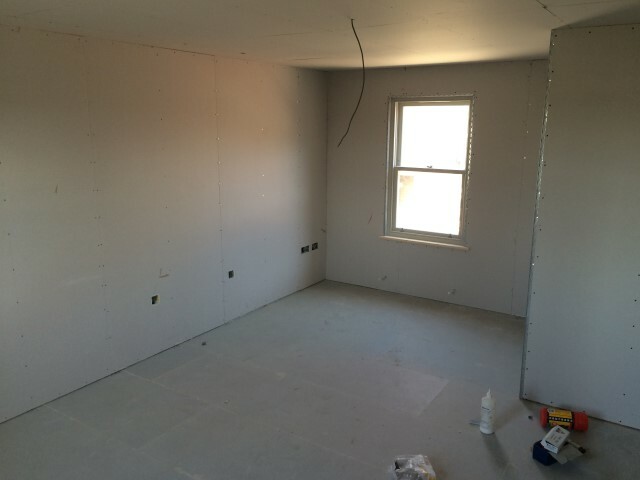 Electrical first fix in place ready for insulation and plasterboard . 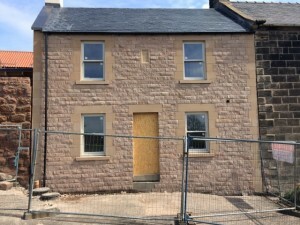 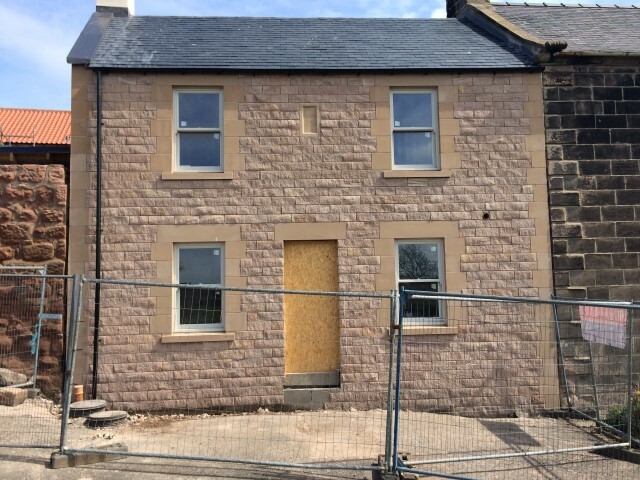 Works have started on the external render coats to the rear properties, this is completed using a hybrid render material with the finished color within the compound. 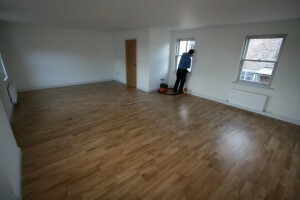 This means no painting ever for the life of the product. 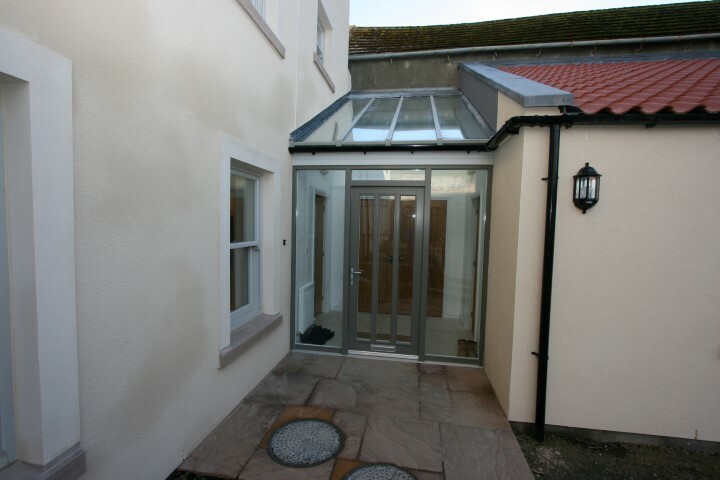 The product also has a flexible property unlike traditional cement based render with are not. 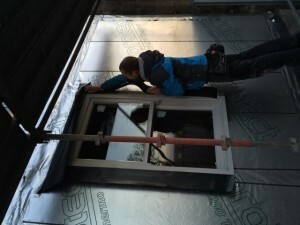 This reduces the likely-hood of any cracking due to movement. 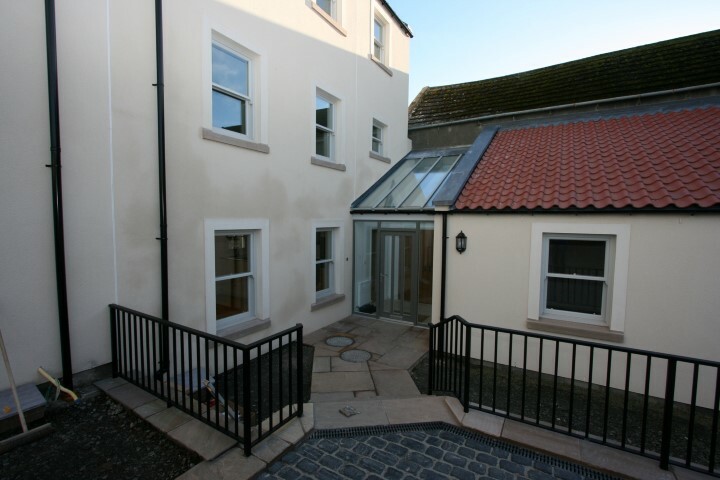 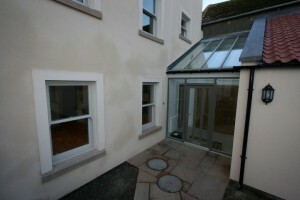 2 of the properties benefit from glazed porches within the Rose-mount court. 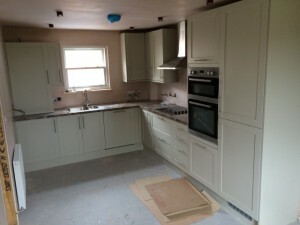 1 Of these is now finished and looks fabulous. 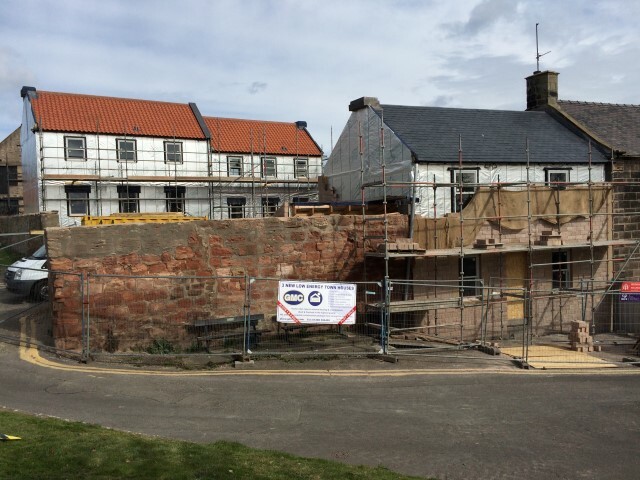 Retaining walls have been be built and the court yard is now ready for landscaping works once the render is complete an the scaffold is removed from site. 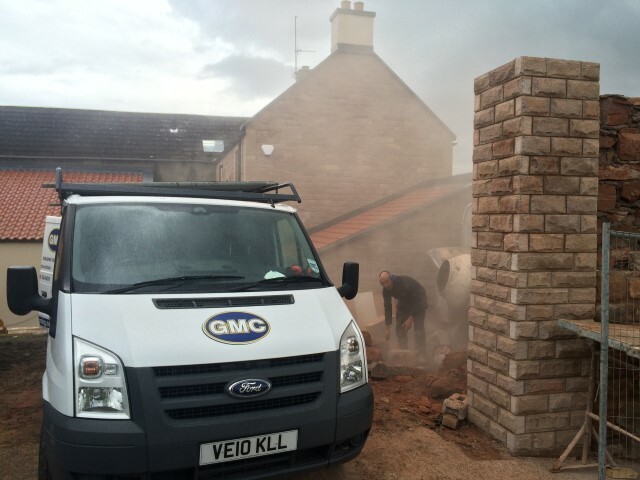 GMC were only on site for 2 weeks of July with our annual 2 week summer holiday. This did not stop progress on site. With additional members of the GMC team on site to drive the development forward. 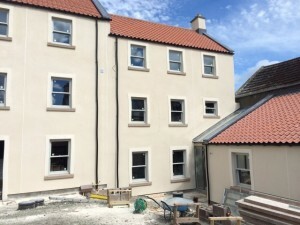 The development is really starting to take shape with the Render works complete to the front and gable. 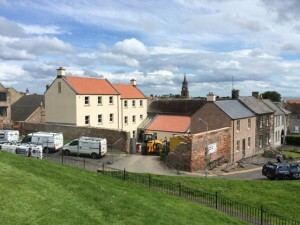 Total transforming the look of town when when driving towards the town over the new bridge. 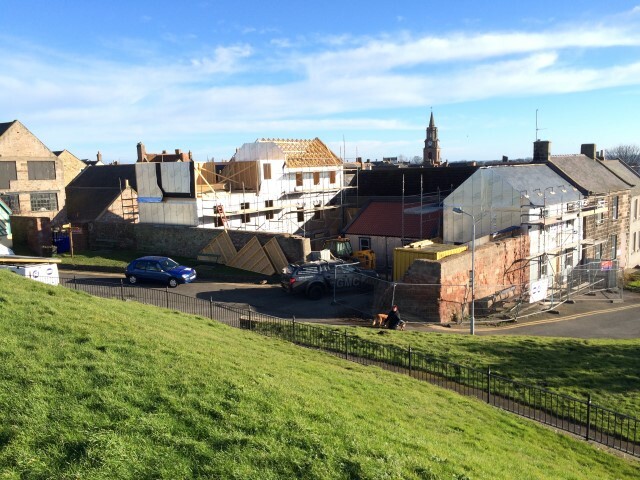 The undulating roof lines perfectly match the towns existing roof scape. 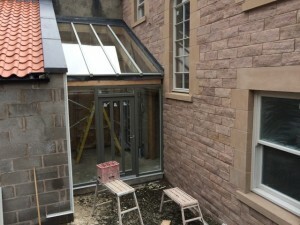 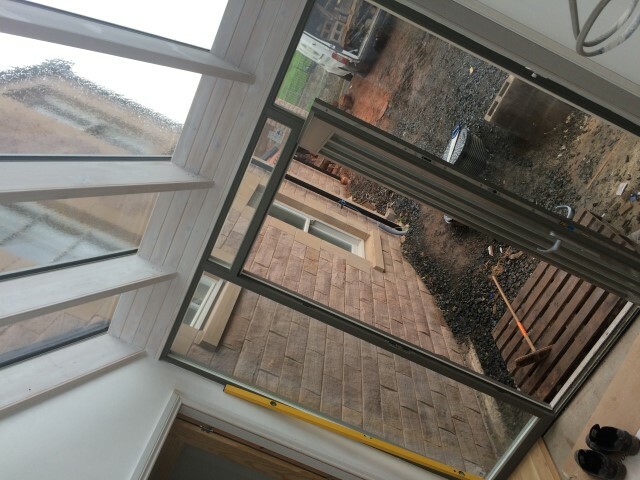 The second of the 2 glazed porch areas is almost complete. 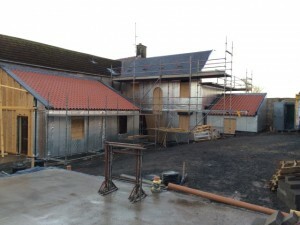 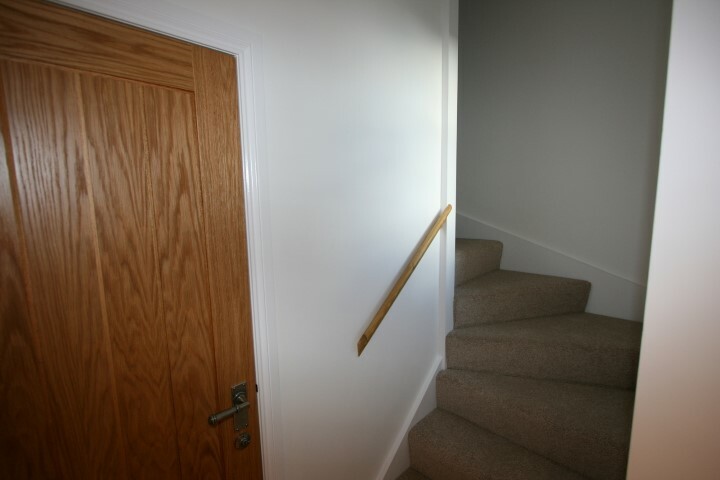 The finished render finish has a dramatic effect on the development! As all 3 properties are SOLD the clients choose their own kitchen to their own taste for GMC to fit as part of the contract. The first of the 3 kitchens are now complete, with the second under way! Lots more internal work this month. 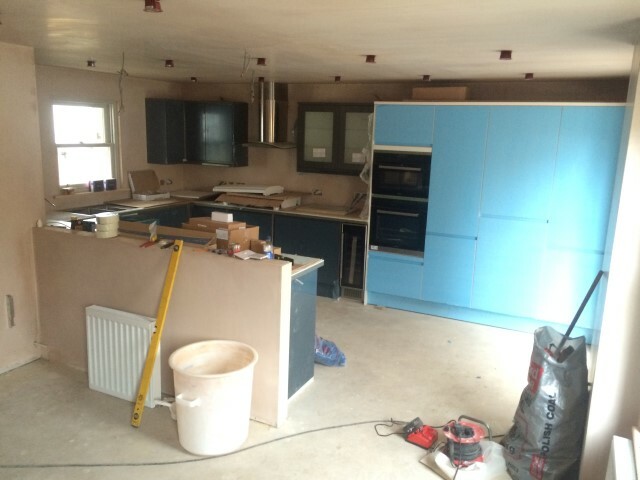 The second kitchen is just about finished, this modern bespoke kitchen has been fitted to the clients exact requirements with breakfast bar and concealed utilities. 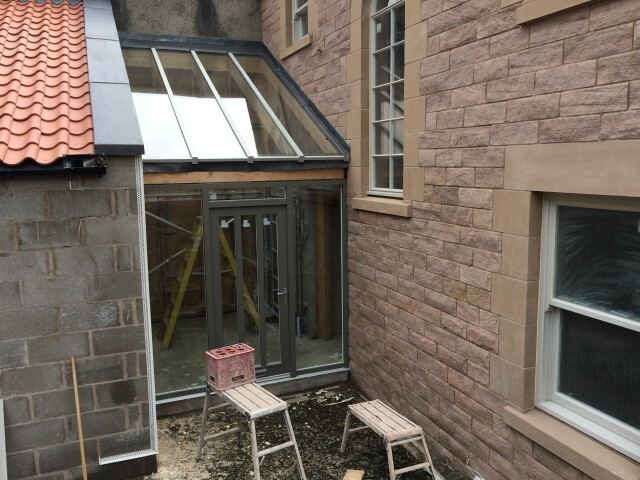 The last of the roof glazing has been fitted above the 2 entrances, this is truly bespoke joinery by the GMC team. More bespoke joinery with hardwood flooring and shelving manufactured ready for decorating. Lots of External works this month. The site team have been busy shaping up the main court area. The site is on an incline so there are several levels to make up & retaining walls. 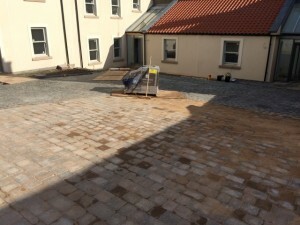 Vehicle and foot traffic areas are marked with different paving materials. 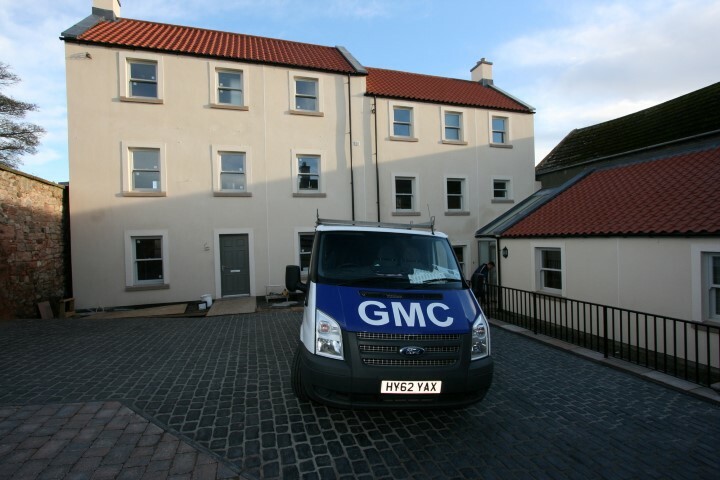 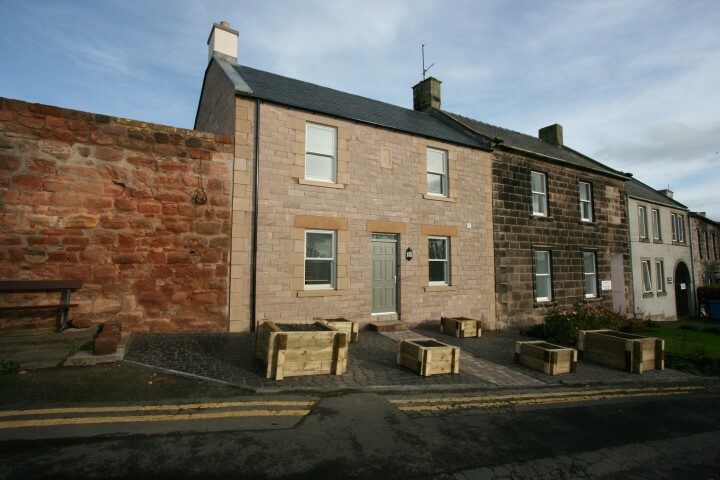 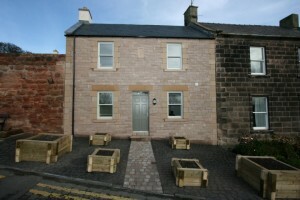 GMC have chosen heritage materials using Tegular, Cobbles and sand stone for different areas. The main entrance is stood with proud sand stone pillars which give a protective quality to court. Mean while indoors painting and decorating teams are busy finishing the properties to their future owners specification. 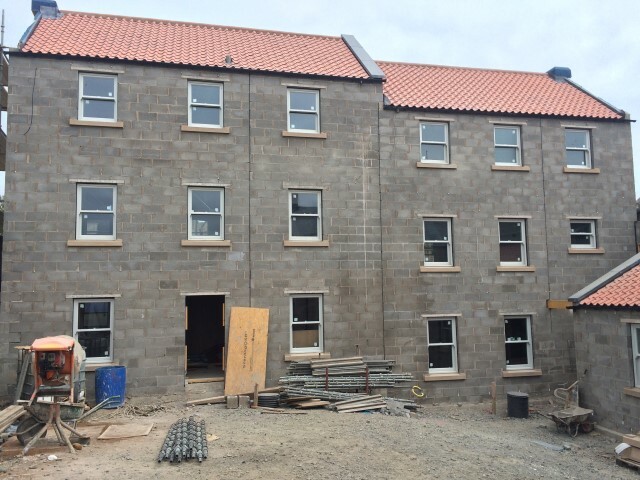 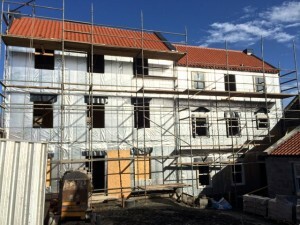 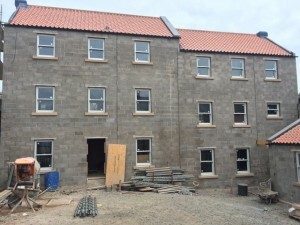 With all properties nearing completion, it have been an exciting month on site! 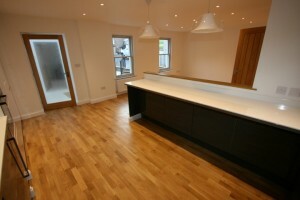 No.2 Rose Mount ready for its new owner to move in this weekend!! 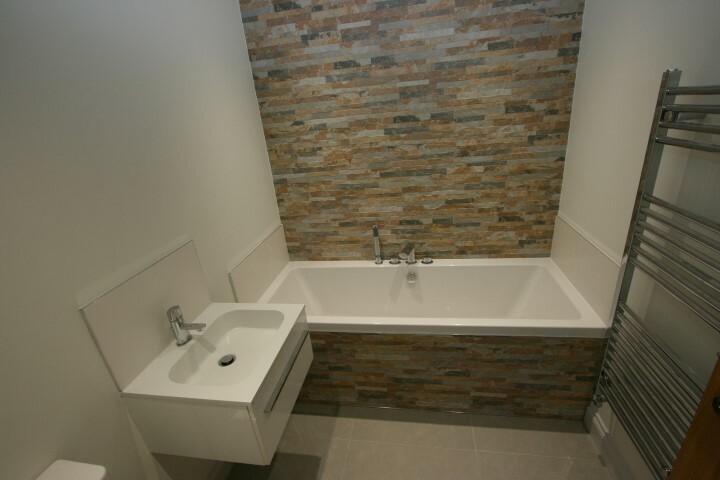 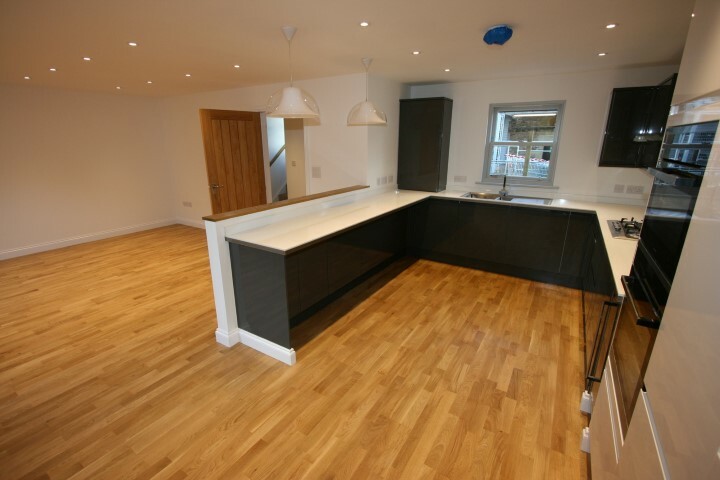 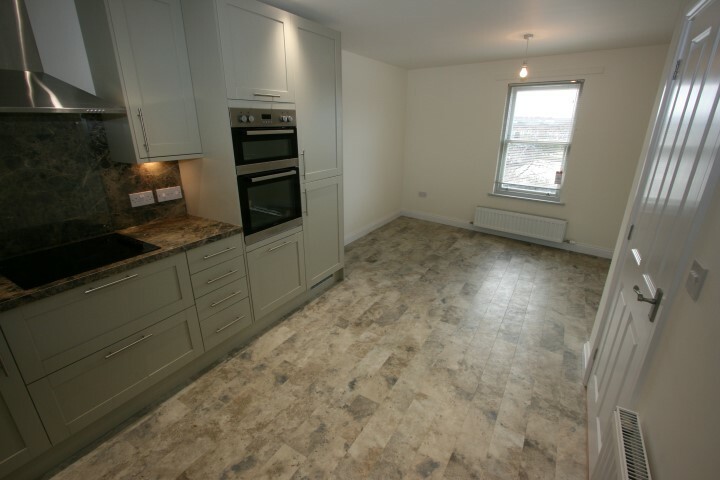 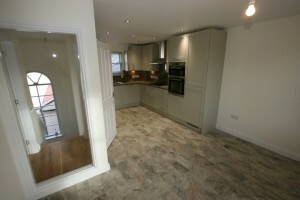 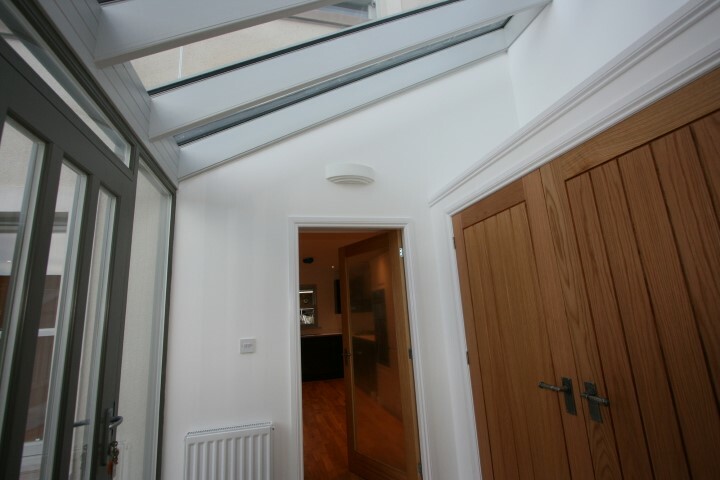 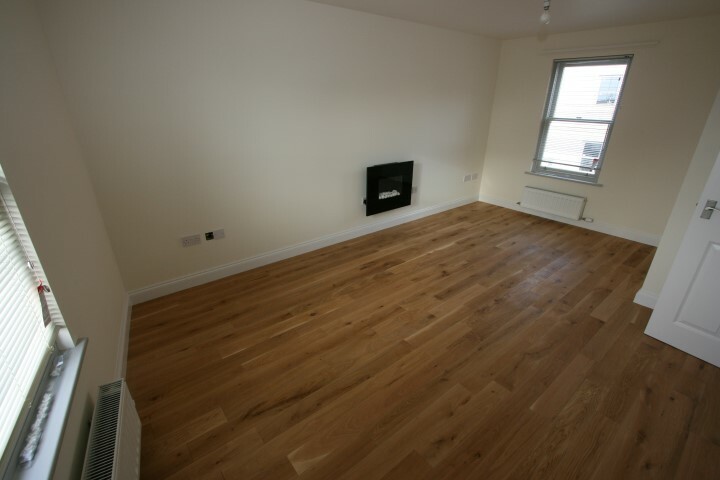 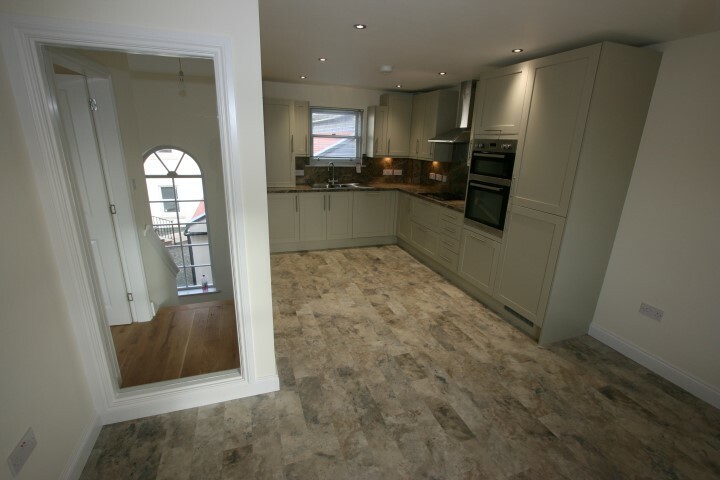 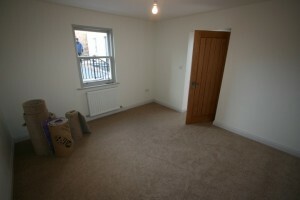 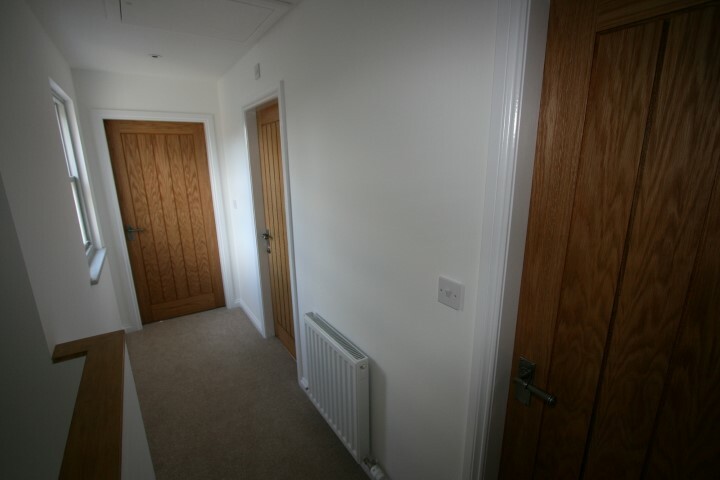 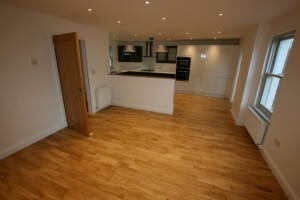 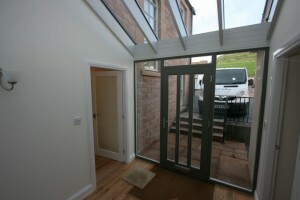 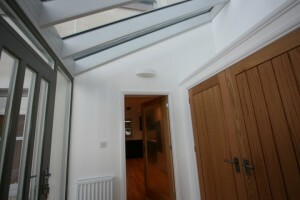 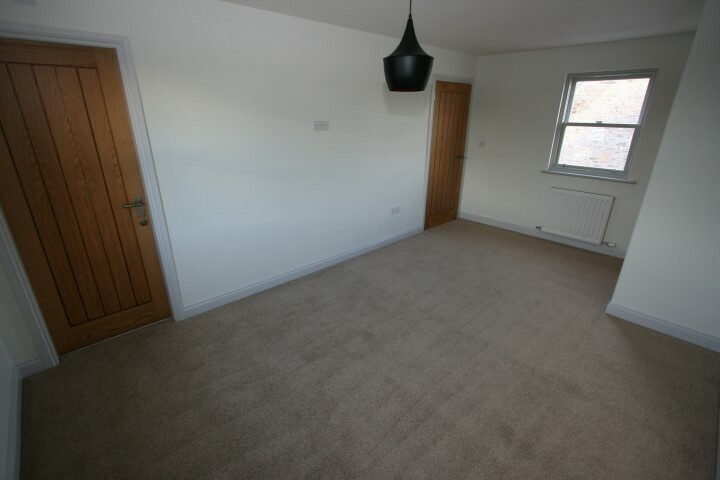 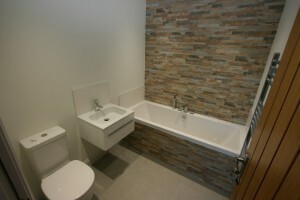 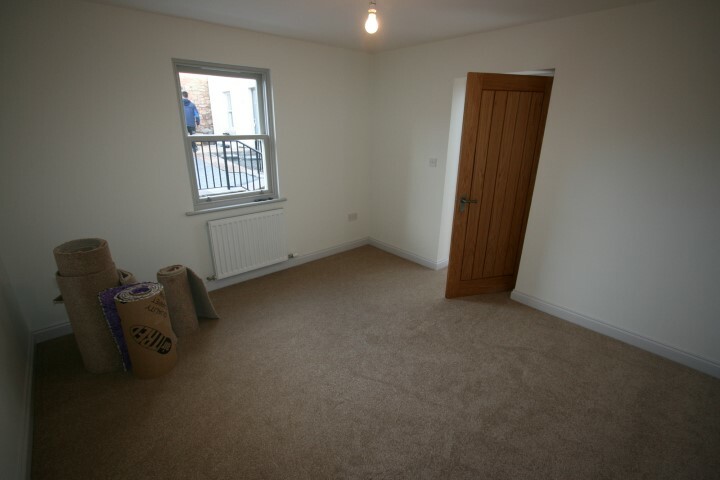 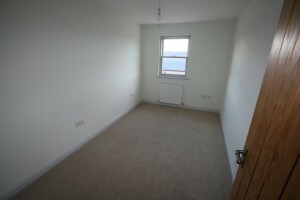 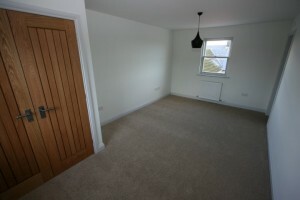 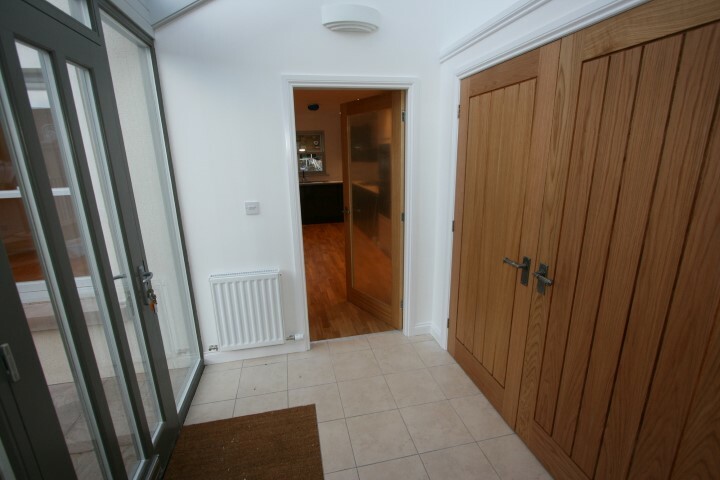 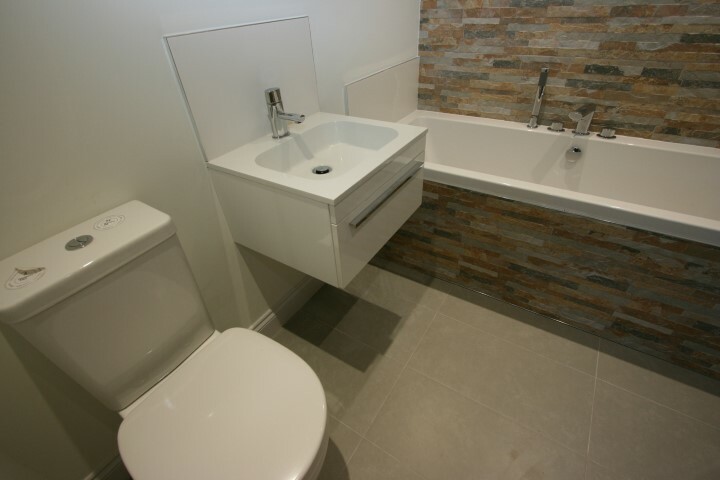 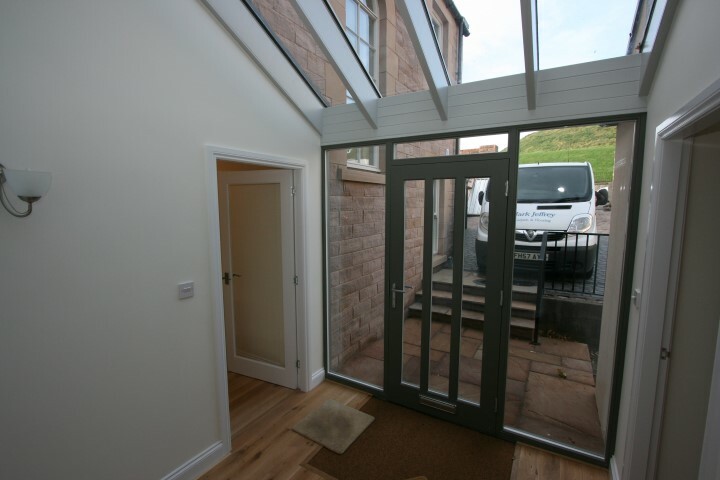 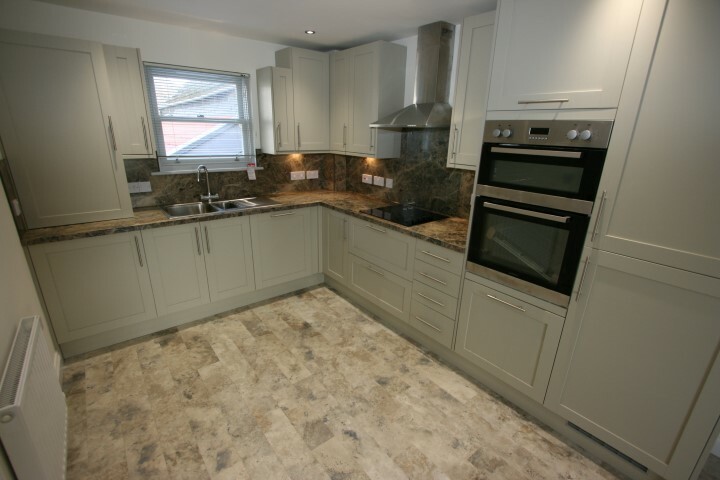 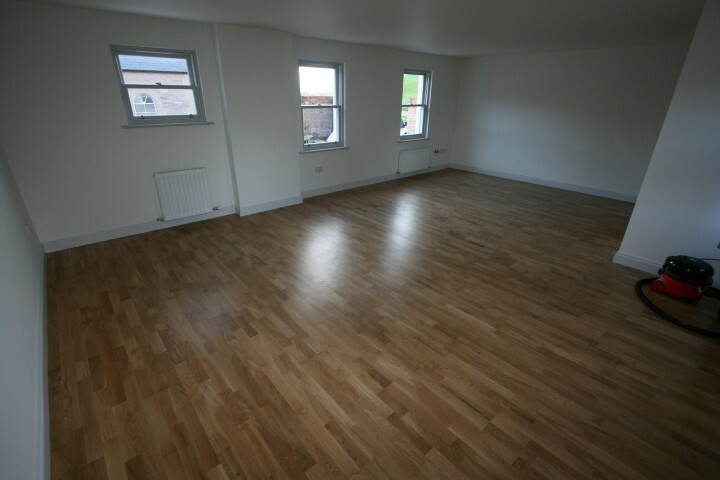 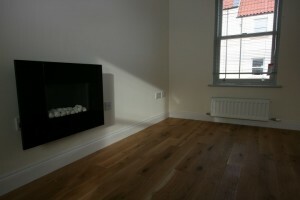 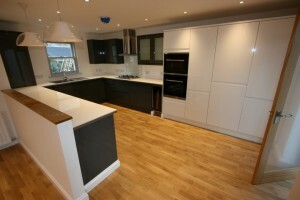 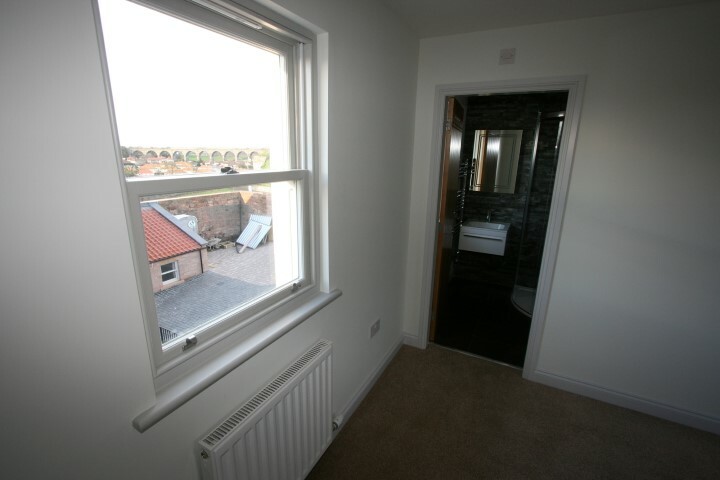 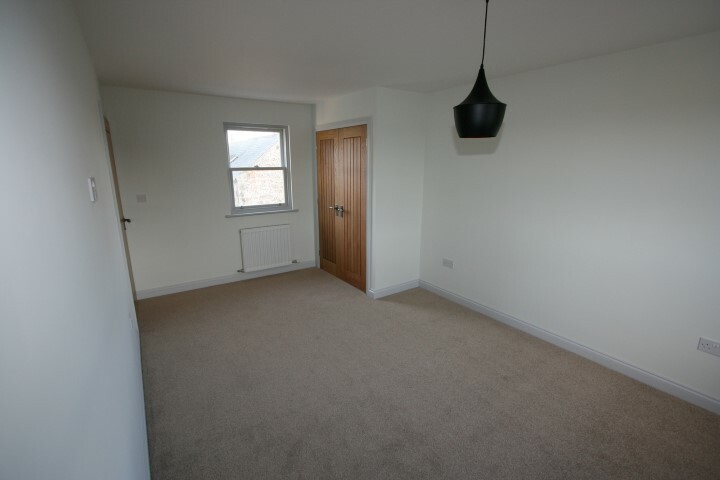 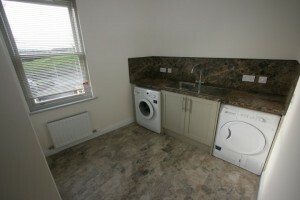 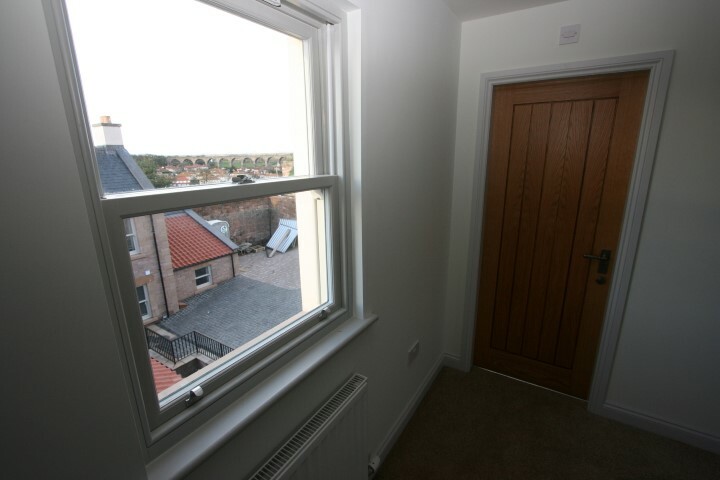 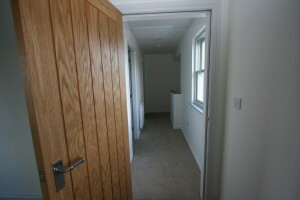 This property has been finished to the clients specific requirements! We think its turned out very nice!! 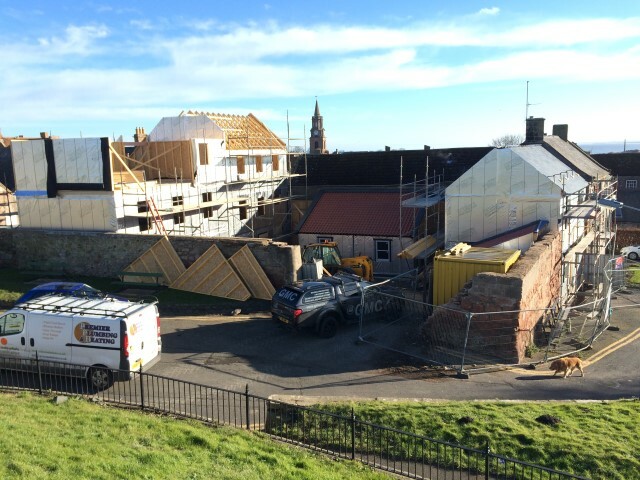 December sees the end to our wonderful development at Bank hill. All 3 homes are now occupied and the finishing touches to the external areas are complete! 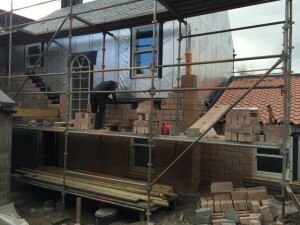 We are now waiting for some decent to weather to photograph the finished article!